JPMorgan Chase & Company: net income of $24.4 billion on revenue of $96.6 billion. JPMorgan reported its highest-ever net income in 2015, and paid out $11 billion to shareholders through stock buybacks and dividends. Bank of America Corporation: net income of $15.9 billion on revenue of $82.5 billion. Net income more than tripled from 2014, and it nearly doubled the dividend it paid shareholders — the bank said it handed out $4.5 billion through common stock buybacks and dividends. 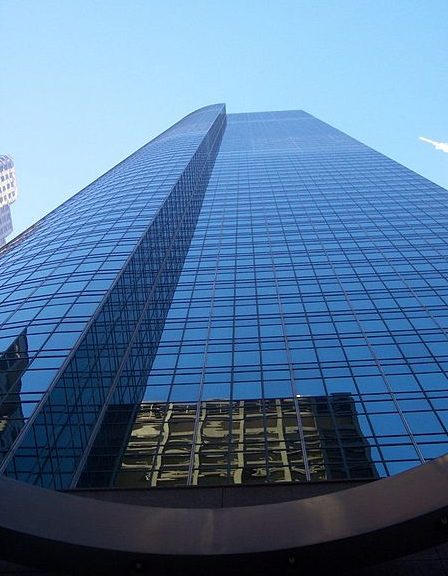 Citigroup Incorporated: net income of $17.2 billion on revenue of $76.4 billion. Although revenue was down slightly, net income more than doubled because Citigroup wasn’t troubled with having to pay out billions in fines over its toxic derivatives as it was in 2014. Wells Fargo & Company: net income of $23 billion on revenue of $86.1 billion. The bank reported it handed out $12.6 billion through stock buybacks and dividends, yet it relentlessly demands its tellers pressure customers to open multiple accounts and pays those tellers too little to live on. The Goldman Sachs Group Incorporated: net income of $6.1 billion on revenue of $33.8 billion. Goldman Sachs’ net income was below that of 2014 due to a $3.4 billion deduction (or “charge”) from its earnings due to its reaching a settlement with government regulators over its toxic mortgage-backed securities; profits would have risen without the fine. But please don’t shed any tears for the investment bank — it proudly reported that it “advised” on corporate mergers and acquisitions worth more than $1 trillion, work that by itself netted it billions of dollars while jobs disappeared. Morgan Stanley: net income of $6.1 billion on revenues of $35.2 billion. Similar to its peer banks, Morgan Stanley shelled out $2.1 billion to buy back its stock in an effort to have its profits shared among fewer stockholders. Despite that profit, the bank has said it will lay off staff as part of an effort to “cut costs” under Wall Street pressure. As ruthless as Wal-Mart is, Wall Street has decided the retailer is not ruthless enough. Incredible though it might seem, financiers have been punishing Wal-Mart in part because the company has raised its minimum wage to $9 an hour. Plans to increase slightly abysmally low pay and invest more money on Internet operations have Wall Street in an ornery mood because profits might be hurt. Is Wal-Mart Stores Inc. about to cease being a going concern? Hardly. For the first three quarters of this year, Wal-Mart has racked up a net income of US$11.8 billion — and the holiday season isn’t here yet. For the five previous fiscal years, the retailer reported a composite net income of $80.2 billion. Alas, this isn’t good enough for Wall Street and its “what did you do for me this quarter” mentality. Traders have driven down the price of Wal-Mart stock by more than one-third in 2015, and a public statement on October 14 by the company that its earnings might be a little lower next year prompted the biggest one-day fall in its stock in 25 years. This is the company that is the most ruthless in accelerating the trend of moving manufacturing to the locations with the lowest wages, legendary for its relentless pressure on its suppliers to manufacture at such low cost that they have no choice but to move their production to China, or Bangladesh, or Vietnam, because the suppliers can’t pay more than starvation wages and remain in business. This is a company that pays it employees so little that they skip meals and organize food drives; receives so many government subsidies that the public pays about $1 million per store in the United States; and is estimated to avoid $1 billion per year in U.S. taxes through its use of tax loopholes. We live under an economic system that is so insane that this has now been deemed by financiers to be insufficiently brutal. The four heirs to the Wal-Mart fortune are collectively worth $161 billion — they are the world’s richest family, richer even than the Koch brothers. The four are each, individually, among the 12 richest people on Earth. The Walton family pocket billions every year just from dividends — their company paid nearly $6.4 billion in dividends in 2014 alone, and the Walton family owns half the shares. The company spent another $6.1 billion in 2014 on buying back its stock. That’s $12.5 billion in one year handed out to financiers and the Walton family. So it would seem that Wal-Mart could afford to pay its employees more. One and a half billion in wages and training for an unspecified period of time. Remember, this is a company that averages $16 billion in net profit per year. And in almost half the states of the U.S., mandatory minimum-wage raises would have forced stores in those states to raise the wage anyway. Or to put this another way, the raises to $10 per hour — assuming the stated cost to the company is real — could be fully funded by cutting what the company spends on stock buybacks by one-quarter. But it’s never Wall Street’s turn to cut back, is it? There are real-world consequences to these developments. A 2007 study by the Economic Policy Institute found that Wal-Mart alone was responsible for the loss of 200,000 U.S. jobs to China for the years 2001 to 2006, with Wal-Mart accounting for two-thirds of all U.S. manufacturing jobs lost during that period. Wal-Mart more recently has begun shifting manufacturing to countries like Bangladesh that are low-cost alternatives to China. The Institute for Global Labour and Human Rights reports that garment workers in Bangladesh earn between 33 and 42 cents per hour, or up to $20 for a six-day, 48-hour work week. 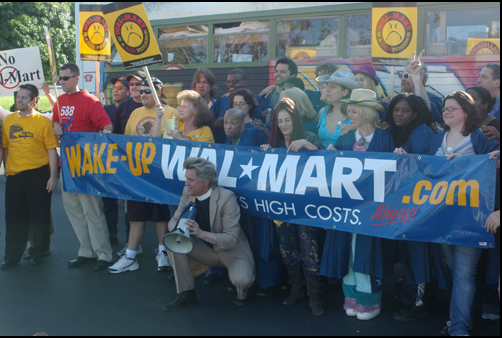 On the backs of those super-exploited workers, and on the backs of exploited store and warehouse employees, arise the fabulous wealth of the Walton family, Wal-Mart executives and financiers. Doug McMillion, the Wal-Mart chief executive officer, was paid $25.6 million for 2014 — or 24,500 times more than a Bangladeshi sweatshop worker working for a Wal-Mart subcontractor earns. More is never enough — Wall Street is cracking its whip, demanding no letup in this massive upward flow of money. No slack is allowed. When do we stop believing this machine can be reformed? More is never enough. A few examples of the wrath of speculators illustrate the “whip” of finance capital as the world’s corporations announced their results in recent weeks. Among the words that do not go together are “shareholder activist.” Whether a sign of the debasement of language, or that the corporate media’s myopia has degenerated to the point where speculators trying to extract every possible dollar out of a corporation is what constitutes “activism” to them, as if this was some sort of selfless activity, these are the words often used to describe wolf packs that grow ever hungrier. Not even one of the world’s biggest corporations, E.I. du Pont de Nemours & Company, is immune. DuPont, a chemical multi-national that produces many products that dominate their market, has racked up about US$17.8 billion in profits over the past five years, including $3.6 billion in 2014. Its stock price increased by 20 percent last year, better than the benchmark S&P 500 Index. DuPont recently sold off its performance chemicals business, and will hand out $4 billion to shareholders from the proceeds of the sale. Surely enough you say? Nope. A hedge-fund manager — yep, one those “shareholder activists” — has declared war on DuPont management. The hedge funder, Nelson Peltz, is demanding that DuPont be broken up into two companies, under the theory that more profit can be extracted, and he is demanding that four seats on the DuPont board be given to him. So far, at least, DuPont management is resisting the hedge funder, but did announce $1 billion in cuts in a bid to pacify Wall Street. That means that more employees will pay for heightened extraction of money with their jobs. Mr. Peltz’s hedge fund specializes in buying “undervalued stocks,” according to Bloomberg, which is code for corporate raiding. It must pay well, for he is worth $1.9 billion. One company that has given into speculators by selling off its best asset is Yahoo Inc. Although widely attacked in the business press for having no coherent plan for growth, Yahoo did report net income of $1.3 billion on revenue of $4.7 billion for 2013, a hefty profit margin, and remained profitable in 2014. Nonetheless, Yahoo said it will spin off into a separate company its most valuable asset, its stake in the Chinese online merchant Alibaba. This is being done so that more of the profits can distributed to speculators. If Yahoo were to simply sell its stake, it would have to pay taxes. By spinning off its holding into a separate company, there will be no taxes paid, and thus more money will be stuffed into financiers’ pockets. “The decision,” The New York Times reported, “cheered shareholders because they will directly reap all the remaining profit from Yahoo’s prescient investment.” Yahoo will also lose its most valuable asset, making the company weaker (and presumably more likely to get rid of some of its workforce), but speculators will make a windfall. That is all that matters in these calculations. Even an Internet darling, Google Inc., is losing its Wall Street halo. Grumbling was heard when Google’s revenue for the fourth quarter of 2014 was “only” 10 percent higher than the fourth quarter of a year earlier, a slower rate of growth than in the past. For the full year 2014, Google reported net income of $14.4 billion on revenue of $66 billion. Based on these results, it looks as if Google will remain a going concern. Nonetheless, Google stock is down 12 percent since September, a sign of financiers’ displeasure. Ah, yes, all would be well if only multi-national corporations did not have to pay taxes. But despite the ceaseless demands by the world’s financiers for more governmental austerity, more cuts to jobs, wages and benefits, more punishment, the world can afford a raise. An Al Jazeera report by David Cay Johnston concludes that U.S.-based corporations held almost $7.9 trillion of liquid assets worldwide. That is more than double the yearly budget of the U.S. government. The results are those familiar to all who are paying attention: Rising inequality and persistent economic stagnation as working people can no longer spend what they don’t have. Almost all of the gains in income are going to the top: From 2009 to 2012, 95 percent of all gains in income went to the top one percent. The “efficiency” that financiers demand is that ever larger cascades of money flow upward. How long will we allow this to go on? They are bigger and badder than ever. The heightened offensive against regulations launched by the financial industry carried forward by the new Republican Party majority in the United States Congress is one demonstration, but just in case you wish more evidence, bank profits got bigger in 2014. The multibillion-dollar fines U.S. government agencies have assessed banks has merely dented profits, and only in some cases. Four of the six biggest banks in the U.S. — which together hold about two-thirds of all assets in the U.S. financial system — reported higher profits for 2014 than in 2013, and in the cases of the other two, it appears that an increase in fines paid was responsible for their decline in profits. Overall, these six banks — JPMorgan, Bank of America, Citigroup, Wells Fargo, Goldman Sachs and Morgan Stanley — racked up a composite net income of US$75 billion on revenue of $413 billion. Those regulators seemed to have taken it easy on JPMorgan last year. The company’s total legal costs for 2014 were $2.9 billion, compared to $11.1 billion in 2013, according to a report carried by financial news network CNBC. Nonetheless, JPMorgan’s $21 billion in profits for 2014 was considered a disappointment by Wall Street, because the fourth-quarter profit dipped slightly from the previous year’s fourth quarter. Thus, the company wasted no time in announcing that “Senior executives at JPMorgan Chase & Company are pressuring managers across the bank to cut costs,” according to Reuters. Wall Street traders have already punished the company by sending its stock down in three of the first four trading days following its “disappointing” results. Not even Wall Street banks are immune from their own role as enforcers. Some low-level employees are about to pay for that with their jobs. Never mind that the U.S. Treasury Department handed out $700 billion to Wall Street (among other measures), bailing out the very banks whose bottomless greed and reckless gambling brought on a global economic downturn now in its seventh year. A downturn paid for not by the banks, nor their executives, but through the endless austerity imposed on working people throughout the world. Not one Wall Street executive has been prosecuted. JPMorgan has been assessed fines for a variety of crimes, among them mortgage fraud and currency-market manipulation. A compliance lawyer for JPMorgan tried to alert authorities to systematic irregularities in mortgage securities before the crash, but was ignored. Jamie Dimon, heroically holding up against the assault on his bank, earned $20 million for 2013. One suspects he will not be homeless once his 2014 compensation is totaled. That his company will need to come up with billions of dollars by 2019 to meet Federal Reserve capital requirements, which will slow down its ability to speculate with money it doesn’t have in reserve, might just have something to do with his whining. The year 2014 was a very good one for banks. Here are the full-year results for the six largest banks, as reported by themselves. • JPMorgan Chase & Company: net income of $21 billion on revenue of $97.9 billion. This was three billions dollars more than the year before, but still not good enough in the eyes of speculators. • Bank of America Corporation: net income of $4.8 billion on revenue of $85.1 billion. The net income is down from 2013, but that appears to be due to “litigation expenses” of $16.4 billion, more than double the 2013 litigation expenses of $6.1 billion. Almost all of those extra expenses occurred in its consumer real estate division; the bank agreed in August to pay nearly $17 billion to settle charges that it sold toxic mortgages. • Citigroup Incorporated: net income of $11.5 billion on revenue of $77.2 billion. Citigroup’s profits were lower than the year before, but the culprit is familiar — it reported legal costs of $4.8 billion in 2014, more than ten times the $430 million of 2013. Citigroup agreed in November to pay $1 billion for rigging foreign-exchange markets and agreed in July to pay $7 billion for selling bad mortgages. • Wells Fargo & Company: net income of $23.1 billion on revenue of $84.3 billion. With profits up from 2013, Wells Fargo said it handed out $12.5 billion to shareholders through dividends and net share repurchases, five billion dollars more than a year earlier. This at the same time that many of its branch tellers can’t move out of their parents’ house because of low pay. • The Goldman Sachs Group Inc.: net income of $8.5 billion on revenue of $34.5 billion. Those were higher than a year earlier. The average pay for Goldman Sachs employees for 2014 was $373,265, but as that includes secretaries and clerks, those involved in speculation make far more. • Morgan Stanley: net income from continuing operations of $6.2 billion on revenue of $33.6 billion. This profit is more than double what the company made the year before, but nonetheless is not good enough. The company moved quickly to appease speculators, announcing it would cut the percentage of its revenue going to wages, pay higher dividends and buy back more stock. What would they do if they weren’t under “assault”? Subject to the same remorseless laws of capitalism as any other industry, the industry rapidly consolidated. The percentage of total industry assets owned by the five biggest U.S. commercial banks has increased more than four-fold since 1990. Nor is that something peculiar to U.S. banking — the five largest banks in the European Union hold 47 percent of their industry’s total assets. The “assault on banks” must have been conducted with a wet noodle. Although by any ordinary human logic, these colossal sums of money should satiate the most asocial speculator, the remorseless logic of capitalism dictates that more is never enough, that profits have to increase steadily. Even the rate of the increase can be expected to increase. While working at a financial news wire during the stock-market bubble years of the 1990s, I vividly recall one day when a major computer company reported a profit of more than $800 million for its latest three-month period, more than the year-earlier quarter, only for its stock price to be driven down. Curious, I discovered that “analysts” had forecast a profit even bigger, and the rate of the increase had been lower than the rate of the increase a year earlier. That was enough for speculators to lash out. The financial industry acts as both a whip and a parasite in relation to productive capital (producers and merchants of tangible goods and services). The financial industry is a “parasite” because its ownership of stocks, bonds and other securities entitles it to skim off massive amounts of money as its share of the profits. It is also a “whip” because its institutions — stock, bond and currency-exchange markets and the firms that trade these and other securities on those markets — bid up or drive down prices, and do so strictly according to their own interests. A management that fails to maximize profits in the short term and deliver higher stock prices in the longer term is in danger of being pushed out, not because diffuse shareholders possess that leverage individually, but because the financial industry as a whole, through the markets it controls, can sell off enough stock to make the price nosedive, leaving the company vulnerable to an unfriendly takeover by a speculator seeking to profit from the reduced value of the company. Executives who do what the “market” dictates, on the other hand, are showered with riches. Governments representing the world’s four largest economies — the U.S., the E.U., China and Japan — committed US$16.3 trillion in 2008 and 2009 alone on bailouts of the financiers who brought down the global economy and, to a far smaller extent, for economic stimulus. These are the governments that are “assaulting” banks. Such is the looking-glass logic of capitalism. “Too big to fail” banks are bigger than ever. Holding the global economy hostage, extracting profits from every aspect of human activity and remaining well above the reach of the law are simply business as usual — not to mention extremely profitable. The six largest banks in the United States — each among the world’s largest — reported composite net income of $76 billion for 2013. Yep: $76 billion in cold cash, for only six enterprises, and that total is the profit after paying out their colossal salaries and bonuses. To put the total in further perspective, the six banks enjoyed a profit margin of 18.4 percent. By way of comparison, the average corporate profit margin in mid-2013 was 9.3 percent. It would seem that financiers have managed to trudge on despite suffering the critiques of people who refuse to believe that their multimillion-dollar compensation is a God-given right. So there you have it: Financiers do not self-select on the basis of lust for money without regard for the damage they do to others, but are anointed by society. Do you recall a referendum selecting them? I do not, either. • JPMorgan Chase & Co.: net income of $17.9 billion on revenue of $96.6 billion. That was JPMorgan’s profit after setting aside $8.7 billion to cover legal expenses. • Bank of America Corp.: net income of $11.4 billion on revenue of $89.8 billion. • Citigroup Inc.: net income of $13.9 billion on revenue of $76.4 billion. Although Citigroup’s 2013 net income was close to double that of 2012, it was nonetheless considered disappointing! Not even Citigroup is immune from the pitiless system it and its peer institutions have created. Its stock price has dropped several points since last week, meaning the market is demanding it squeeze out more profits. • Wells Fargo & Co.: net income of $21.9 billion on revenue of $83.8 billion. • The Goldman Sachs Group Inc.: net income of $8.0 billion on revenue of $34.2 billion. Those profits are after compensation and benefits totaling $12.6 billion. The average compensation for a Goldman Sachs employee for 2013 was $383,000, lower than the $399,000 of 2012. Oh the humanity! • Morgan Stanley: net income of $3.0 billion on revenue of $33.1 billion. How big are these six banks? So big that they hold 67 percent of all the assets in the U.S. financial system, considerably more than they held five years ago. Goldman Sachs and its peer intitutions seek to extract money from every aspect of human activity. These, and other banks, have never had to accept responsibility for bringing down the world’s economy. Other than a few individuals who have been hauled into court because their scheming was too blatant to ignore (who are always tagged “rogue traders” as if they don’t operate within a well-established system), it’s business as usual. Why should the we be at the mercy of a tiny elite that knows no limits to its rapaciousness? A crucial component of a better world would be a drastically shrunken banking system, under democratic community control, oriented toward human need and rational investment, and prohibited to engage in any speculation. Banking should be a public utility. The point of a market is to serve humanity — yet under the current world capitalist system, human beings exist to serve markets. And markets are nothing but the aggregate interests of the most powerful industrialists and financiers. Financiers may see themselves as untouchable monarchs when they look into a mirror, but we need not swallow such nonsense any more than our ancestors did when they ceased to believe that a king is chosen by God to rule over everyone.